I have gone concho crazy. It’s understandable, really, when you consider that I spent several decades galloping around the hunter show ring clad in drab navy blue wool. My inner penchant for anything bright, shiny and frilly was kept repressed. But now that I’ve embraced the lifestyle of riding western on the trails, I am making up for lost time. 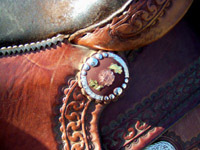 Got plain leather tack? Add a concho! Need to enliven an old leather belt? Add a concho! Guess what else I’ve discovered. Conchos are not particularly expensive. I mean, they’re not pricey like hay or anything like that. This concho craziness has begun to approach the same level of obsession I once had with The Bedazzler. That mind numbing device was a little craft gun that blasted crystal rivets and beads onto… well, onto whatever would hold still long enough for me to bedazzle it into rhinestone oblivion. When I found myself restraining my Schnauzer so that I could bedazzle her collar, I knew it was time to set the gun down. I’m not quite there with the conchos. I’m still able to restrain myself from hoarding conchos just in case there’s suddenly a great concho shortage. Unfortunately, the fact that I live in a very horsey community isn’t helping my burgeoning addiction. Today I was browsing through a little antique shop that’s next door to my favorite feed store. I bought a dainty vintage plate to hang on the wall of my spare bedroom. And then, as I was paying for my purchase, I leaned against a glass enclosed case that was full of antique jewelry and discovered an entire tray of… CONCHOS! Oh, they were luscious! I asked the shop owner to take them out so I could fondle them. I caressed each embossed design: steers, stars, pistols and poppies. A soft patina graced each one, making them even more alluring. 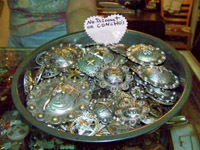 I wanted to buy the whole caboodle of conchos, but I controlled myself. I haven’t yet become that insane. After all, there’s a dwindling amount of unadorned leather in my household. Glad you’re enjoying yourself, but don’t forget that it’s more to clean. 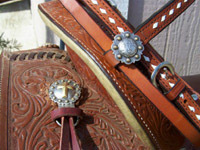 I love my western saddle with all the detailed design and silver work but boy it sure it a pain at tack cleaning time. Oh, good lord. It’s the Bedazzler all over again! Step away from the conchos, sister mine. Just. Step. Away. You sound just like me. Except I went crazy with swarvoski crystals. I started adding them to my show clothes and then I lost all control.